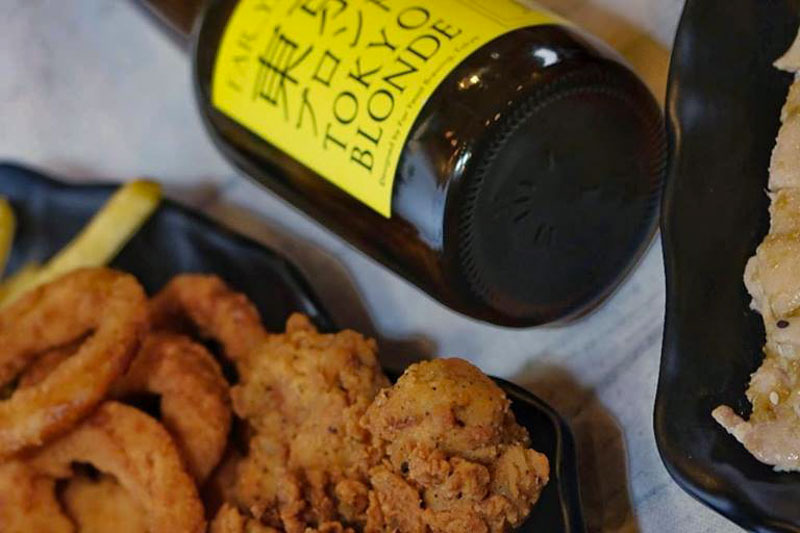 Known for their American-inspired fried chicken, Birdfolks at NEWest also uses a mix of local spices in their dishes. If you’re looking for something new, you’re in luck. Birdfolks has decided to release a new menu with a range of burgers and hot devil wings to spice things up! Following our current health food trend, they’ve decided to add a variety of salad to their menu as well. At Birdfolks, diners get the choice of grilled or fried chicken with their greens. The interior of Birdfolks was very chic and illuminated with a warm orange hue, the birdcages hanging down from the ceiling, and vibrant abstract artwork on the wall lending a joyful and cosy setting to the restaurant. The best part of it all is the large birdcage decorated with fairy lights and pastel flowers on vines at the front of the eatery, where you can spice up your Instagram with a few photo opportunities here. Not only was their store colourful and lively, but their food was just as vibrant too. I started my new Birdfolks adventure with their Hawa Yaki Burger (S$15.90). 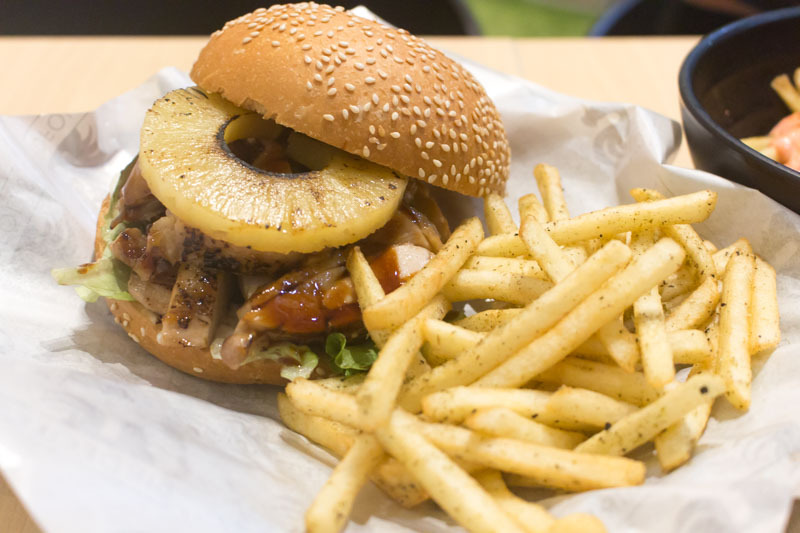 Two sesame-studded buns sandwiched a teriyaki grilled chicken, which was topped with a slice of golden pineapple. This burger was filled with contrasting flavours. The sweetness from the honeyed pineapple with the savoury chicken complemented the aroma of the sesame bun. Each burger is paired with a side of slightly peppery Oregano Fries. Despite how delicious the burger was, it was pretty messy to eat. Since the grilled chicken were cut into strips, they fell off the bun after every bite. The teriyaki sauce also made my fingers sticky after trying to piece the burger back together. The new menu also includes more variety of fries, other than the Oregano Fries (S$6.90/medium, S$8.90/large). The Mentaiko Fries (S$11.90) is a must try. 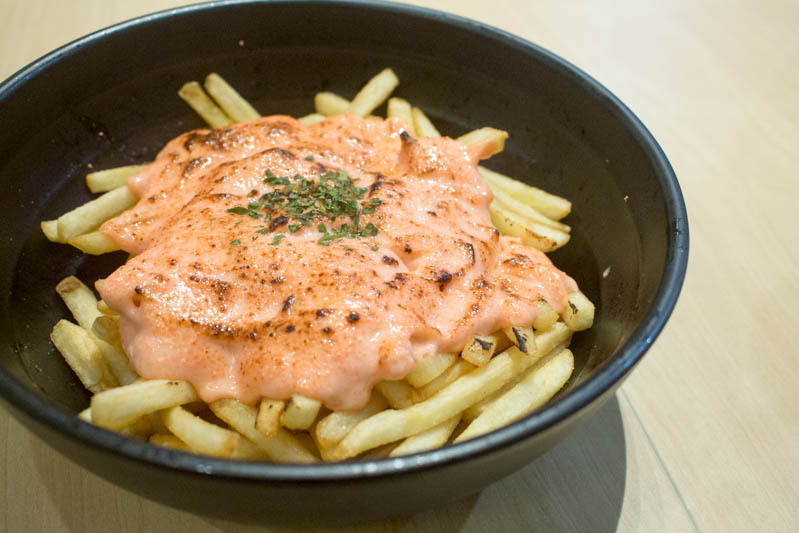 There was a good ratio of mentaiko mayo and fries, and the sauce also added a seafood aroma to the dish. However, the fries were slightly bland, which meant most of the flavour came from the mentaiko mayo. Previously, Birdfolks only sold non-spicy chicken wings. 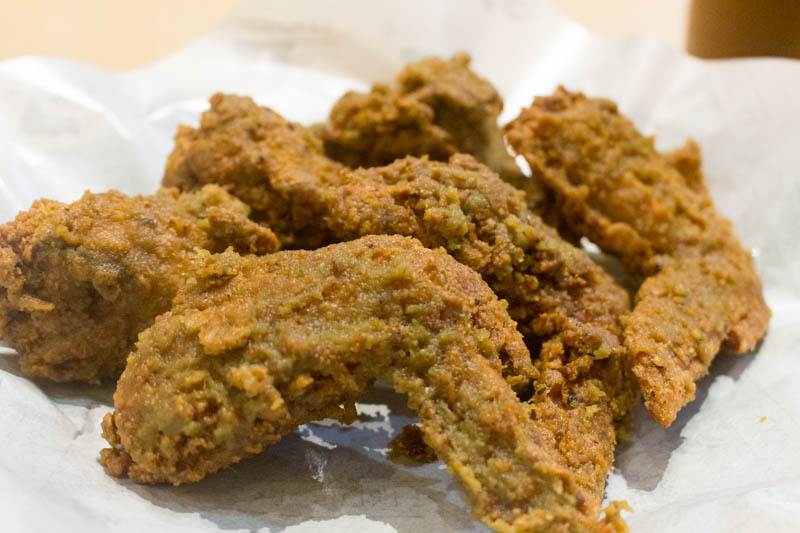 Spicy lovers, you’re in luck, because, they now serve the Hot Devil Wings (S$12.90 for 6pcs, S$24.90 for 12pcs). This is one of the spiciest wings I have had in Singapore! The crispy chicken skin was made with a special blend of white chilli that was really spicy and I broke a sweat just eating it. I had to peel the outer batter off so that I could enjoy the glistening, juicy meat on the inside without dying from the spice. 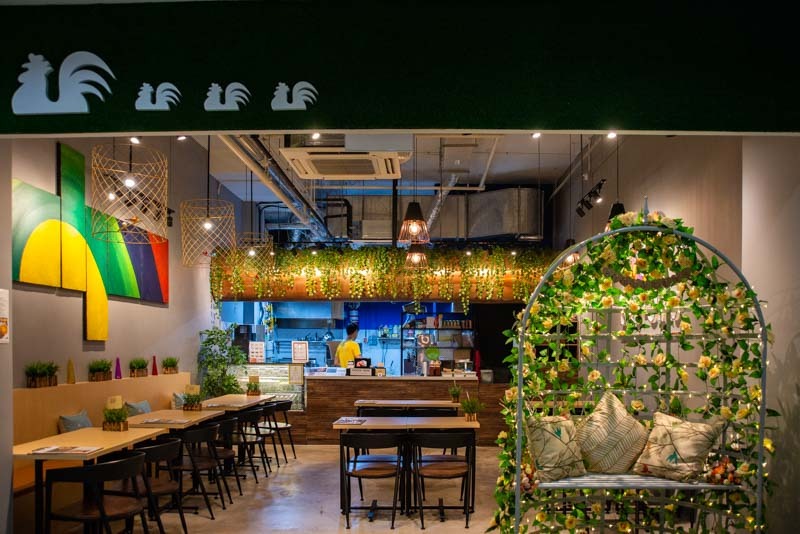 Not only has Birdfolks expanded their food selection, they’ve also increased their drinks list, adding some unique flavours such as Chendol Kopi (S$4.00) and Peach Kopi (S$4.00). 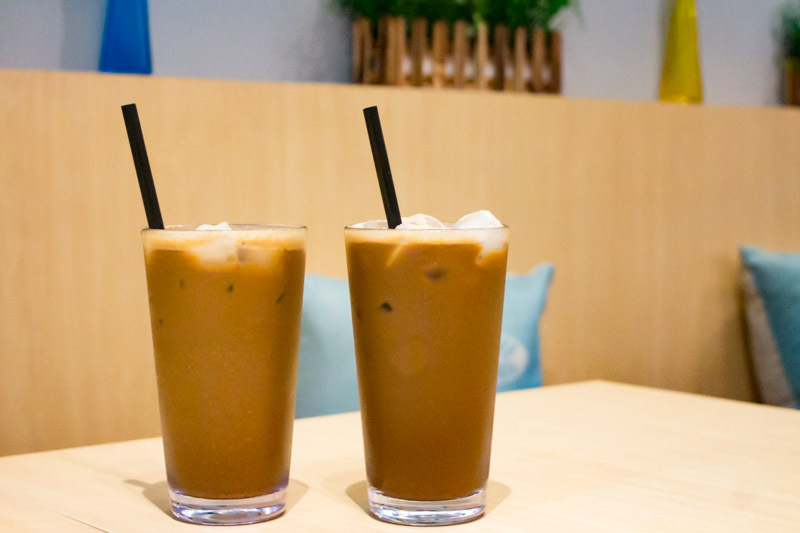 The Chendol Kopi was infused with gula melaka and coconut syrup. Chendol is commonly associated with a rich coconut taste, however, it was very mild and can only be tasted after a few sips as the owner didn’t want the coffee aroma to be overpowered. The Peach Kopi we had was an acquired taste. Like the previous glass of coffee, the fruity flavour was overpowered by the richness of coffee. My first sip had a faint sour taste but the peach flavour only came through in the aftertaste. Diners who are looking for something stronger, Birdfolks is also selling newly imported beers to enjoy with your meal. Make a trip down to the West and head over to Birdfolks to enjoy their new items on the menu with your family and friends.